One of the best benefits of having perfectly straight hair is that you can pull off any kind of hairstyle with extreme ease. Be it a casual ponytail or an elaborate hairdo, perfectly straight hair would enable you to do all that and more. Better yet, straight hair tends to be extra glossy and slick, and would make you look like a diva with minimum effort. Sadly, not everyone is blessed with straight hair. And those wishing to achieve the same often tend to resort to synthetic products and chemical treatments. While these products and treatments would enable them to get salon like glossy and straight hair, with time (and continuous exposure to these products) the hair follicles would become permanently damaged and lose their natural sheen and luster. The end result? The person would be left with nothing but a ‘bad hair day’ every day for the rest of his/her life. Given below are some excellent home remedies for those wishing to get straight hair without visiting a salon. These remedies would help straighten your tresses naturally without spoiling it in the process, and without burning a hole through your pocket. So read on! Milk contains proteins that can fortify the hair shafts and reduce frizz, thereby making your hair look and feel smooth and unbelievably straight.Pour some milk into a spray bottle and spray some milk on the hair strands, making sure you cover the hair all the way from the roots to the tips. Rinse your hair with cold water after 30 minutes or so with a conditioner. Coconut milk can help straighten your hair out and make it look glossier than before. Extract the milk from a coconut and rinse your hair with it after a hair wash. Rinse off the milk in cold water after about 10 minutes for desirable results.You can also add the juice of a lemon to one cup of coconut milk and keep it in the refrigerator overnight. Apply the creamy paste the next morning and rinse it off with cold water after about an hour or so. Many celebrities swear by the hot oil massage which they guarantee would leave you with frizz free, smooth, glossy and perfectly straight hair. Heat some coconut oil (you can use castor oil or olive oil as well) until it becomes warm to the touch. Don’t heat the oil too much though as it can burn the hair follicles. Apply the warm oil all over your scalp, massaging it gently into the skin as you do so. Once you have covered the entire scalp and the hair all the way from the roots to the tips, cover your scalp (and hair) with a towel. Remove the towel after about 30 minutes and wash your hair with a good quality shampoo and conditioner. You will be able to notice the striking difference after the first wash itself. Just like face masks can do wonders for your skin, hair masks can help you get super straight hair quickly and effectively. One such hair mask that you can try out is the essential oil & aloe vera gel hair mask. Mix half a cup of Aloe Vera gel with 10 drops of essential oil. You can opt for any essential oil although the ones that provide the best results would include sandalwood and rosemary oil. Add half a cup of heated coconut or olive oil to the mixture and keep it overnight. Apply the mask over the scalp and hair the next morning and leave it on for about 2 hours. Rinse it off with a good quality shampoo and conditioner afterwards. Make a paste containing a cup of milk and one tbsp. raw honey. Blend a few strawberries and add them to the mixture. Apply the resultant paste over your scalp and hair, covering the roots and tips thoroughly.Wrap your hair in a towel for about 2 hours. Rinse your hair with a good quality shampoo and conditioner afterwards. Comb your hair with a wide toothed comb as your blow dry it in order to make it look straighter and shinier. Mash two bananas and add two tablespoons of honey, yogurt and olive oil to the paste. Mix nicely and refrigerate the resultant mixture for about 30 minutes. Apply the resultant mask on the hair and cover it with a towel or shower cap. Rinse if off with cold water after about an hour for desirable results. You can opt to add an egg white into the mixture for extra conditioning. Although it might take quite some washing to remove fuller’s earth from your hair, the end results would be amazing. Add one cup of fuller’s earth and 5 teaspoons of rice flour in a bowl. Mix nicely. Add an egg white to the mixture and a little bit of water to make a loose paste which can be applied on the hair. Note that you need to comb your hair nicely before applying the mixture. Cover the roots and the tips thoroughly and wrap your hair with a towel for about 30 minutes. Keep combing your hair with a wide toothed comb at regular intervals while applying the paste. Wash the paste off with a good quality shampoo afterwards. 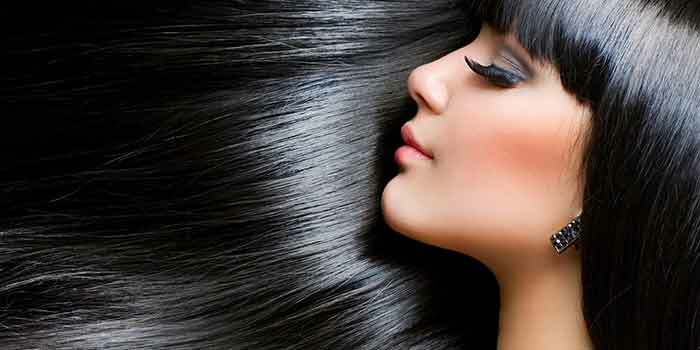 Follow this remedy for at least once in a month for straight and shiny hair. Many individuals tend to apply a conditioner and then rinse it off in a few minutes. This method may not work with every conditioner as different conditioners have different working conditions. While some conditioners would need just 5 minutes to work on the hair, others would need at least 45 minutes to provide effective results.The amount of time you leave the conditioner on the hair would also depend on the amount of moisture present in your scalp. So if you don’t get desirable results within a few minutes, try keeping the conditioner on the hair for longer periods after washing it. Hot water would open up the pores and remove the conditioners effect on your hair. Make it a point to rinse your hair with cold water after conditioning it as this would seal the pores and enable the hair follicles to retain the effects of the conditioner for longer periods. After washing your hair, stand under a fan or in front of a cooler. Comb your wet hair with a wide toothed comb. Reach the tips and stop there for a moment (about 5 seconds), gently tugging at your hair to make sure it remains straight. Comb the rest of your hair the same way. Note that you need to keep on combing your hair until it dries completely. Any amount of moisture left in the hair would lead it to curl up or look frizzy.